The Turkish Angora Cats have descended from the African wildcats. Traders from Egypt brought cats into Eastern Anatolia, where through natural selection and inbreeding, the Turkish Angora was developed along with the Turkish Van. The Turkish Angora was brought into Europe where it was brought almost to extinction in trying to improve the coat of the Persian cat. Today, the Turkish government runs a breeding program to preserve their national treasure. There are no specific types of Turkish Angora Cats. The Turkish Angora have a silky longhaired coat, originally white. Today, there is a large variety of colors in Turkish Angora cats including black, red, blue, lavender, smoke, etc. The eyes of the Turkish Angora cats are blue, green or amber. 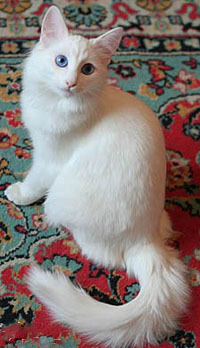 Some Turkish Angora cats, however, may be odd-eyed- i.e they have one blue eye and the other green or amber. Their eyes are almond shaped and their ears are long and pointed. Their tail is plumed and they usually carry it upright, perpendicular to their backs. The Turkish Angora cats are considered dog like in many aspects. They are outgoing, friendly and people-friendly. They are also playful and like the attention of people. Turkish Angora Cats need minimal grooming, except regular brushing since they are longhaired. It is important to ensure regular brushing especially during summer months when they are shedding. Also, Turkish Angora cats are prone to deafness and genetic diseases like Ataxia and Hypertrophic Cardiomyopathy. 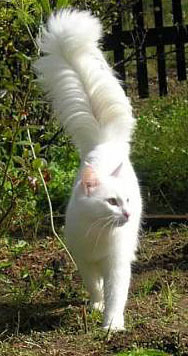 Turkish Angora have very stunning tail! It’s amazing. I own a turkish angora/domestic cat mix. It is mostly turkish angora as distinguished by it silk-like fur, petticoat tail and golden eyes. It is one of five in a litter, four I managed to adopt out to good homes. The four females inherited the distinguishing angora look. My angora has had a problem with diarrhea since after being weaned, and so far, even with vet treatments, I can’t seem to help her get rid of it. If anyone knows a suggestion, please advise. On a positive note, she is one of the best cats I have ever owned: playful, full of personality, loving and intelligent. Any assistance with curing her problem will be deeply appreciated. I hope this is not too late. I have two Turkish Angora and have discovered that they need a grain free diet. Try Wellness Core and any other grain free dry food. Hi! I am Roland and I lived in Singapore. I read alot on the turkish angora breed and I love the breed. Can someone advise where can I get the breed in Singapore? Your help on this matter is greatly appreciated. My Turkish Angora had two colored eyes blue and green he just passed away monday from an Upper respitory infection he was amazing best cat I ever owned he slept with our German Shepherd they were bestfriends.They have the best personalities!! MY CAT IS THE AMERICAN BOBTAIL CAT! I have been looking for a turkish angora for a while now. i live in las vegas, nv. i read that these types of cats were very similar to dogs? i have a tiny yorkie. if anyone knows where i can purchase one, please let me know! Im not a cat person but i fell like i should have at least one cat in my life time. And i would like to know…what kind of cat is Mittens from the movie “Bolt”? i wounder if u are still interested in adoption a Turkish angora cart . i have both male and female to gives out for adoption . have you tried a different type of cat food? try adding alittle cooked rice to the food its supposed to make the stool firmer. I also have a mix breed angora he is a black one with a tiny little white patch on his chest and a smokie tail. his mom was a white and black american domestic, dad is all angora. any way he eats purina kitten chow and I mix in the adult mix in since he is almost a year old. Have adopted a white Turkish Angora male that looks to be 1 yr or older. He is and odd eyed cat but the blue eye seems to have a cloudy cast to it and the pupil is enlarged. Are there certain kinds of eye issues with these odd eyed cats? I have a beautiful Turkish Angora male cat with blue eyes, not deaf. He often suffers from his teeth/gums and problem with hairball – I found him around the building i lived about 7 years ago when he was just a 6 month old. Very friendly, smart, sweet, i couldn’t believe someone would through him out. I put his picture around my neighborhood but no one ever called. I’m lucky i found him. do they shed a lot?